Last summer my sister, Margaret, and I came to a decision that will change the course of our lives. Neither of us has traveled as much as we would have liked, and neither of us is getting any younger. These two facts, along with financial considerations, were the impetus to our considering a full-time life as RV nomads. By last summer, she and I had already been familiarizing ourselves with the nomad lifestyle by watching lots of YouTube videos. The more we discussed it, the more we thought we should try this lifestyle. Margaret already has an RV—a Roadtrek camper van—so, no need to shop for a rig. She and I put our thinking hats on and she came up with the perfect name for our adventure, the Over the Hill Sisters! So, for any of you reading this, I invite you to read more about us and follow our adventures at our blog, Over the Hill Sisters. I've been doing things my own way as valeehill for well over a decade. It may take the two of us a while to get posting-as-a-duo down pat, so please bear with us. I look forward to meeting nice folks on the road and online. Of the many thousands of photos I’ve taken in my lifetime, surely this one will remain the I-was-in-the-right-place-at-the-right-time winner. (The lush spring grass bathed in the sun's glow lasted only minutes.) It was three days after losing my precious Lizzie, and I was crying as I walked. (I remember having to wipe the tears from my eyes to see the image on my phone.) 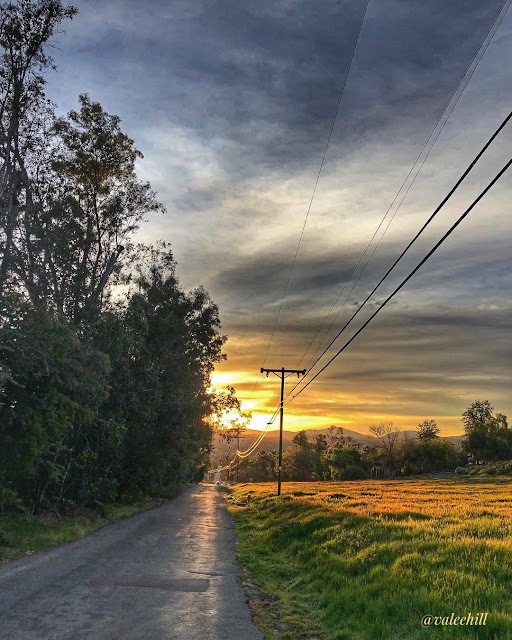 I normally do whatever I can to avoid capturing power lines, but in this photo, they starkly represent the dichotomy of humans vs. nature. One year later and I still feel blessed that I was there, at that precise moment, to experience it. A track star with nothing to lose. A college coach who may lose everything to save her. Olivia is her own worst enemy, with a smart mouth and a past she can’t seem to escape, and the last person she wants help from is a cocky track coach she can never seem to please. Refusing to be pushed away, Will is determined to save her...and determined to resist an attraction that could destroy them both. 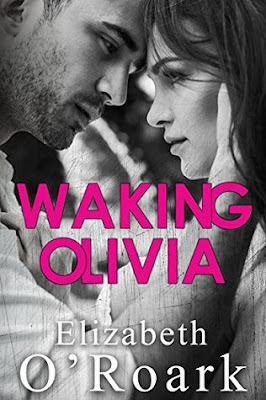 You don't want to miss Waking Olivia, winner of the IBPA's gold medal for romance. Buy this seat-gripping story of forbidden love today. When I say I really needed this book now, I am not exaggerating. I wanted to escape my problems—the world's problems—and be swept away. I can't imagine a better fictional landing place, where I would have been more emotionally involved, than within the breath-stealing story of Olivia and Will. The enormous amount of highlighting and the notes I was compelled to write are a true testament to the skills of the author. I alternately chuckled, full-out laughed, sighed, gasped, cursed, cried, and ranted all the way through. I have a rather low threshold when it comes to in-your-face heroines. The too-tough women who come across as one-dimensional victims of their traumatic pasts. Right away I was intrigued by how the author portrayed Olivia. With her smart mouth, sharp wit, stinging comebacks, and tough persona, I found myself captivated with her character. She was a fascinating and multi-dimensional young woman I just had to find out about. With the introduction of Will, I knew this story was going to do me in. The word "chemistry" is thrown about so commonly in romance books, but the push and pull between Olivia and Will couldn't be contained or described with such a commonly used word. They were dynamically charged right from the start: intellectually, emotionally, and physically. Hence all of my effusive emotions! I'm not one for manufactured angst and often get so frustrated by how much an author thinks that I, as a reader, should be induced to fits of empathy. When, in reality, all of their excessive but-not-warranted turmoil does nothing other than irritate me. I think Elizabeth O'Roark precisely balanced the drama, humor, torment, and passion to create a memorable and extremely gratifying "forbidden love" story. I would love to thank the person, gods, or algorithm that put Waking Olivia in my sights, but I can't remember where I was made aware of it or its previously unread-by-me author. I've certainly been positively consumed by this work and am eager to feel the same with her other books. "Yeah, you'd love that, wouldn't you? I’m apparently the only person on this team who needs constant correction." "Has it ever occurred to you that I ask more of you because I think you’re capable of more?” he demands. “The rest of those girls are giving me everything they have, but you are not. Do you want me to just let you plod along and get through college having never taken first when you know you have the potential to?" “Yeah, I mean, can you imagine yourself as, say, an oncologist? I'm pretty sure saying things like 'your healing is crappy' and 'get better faster' wouldn't be as well-received by patients as it is by me." "Get in the car. My mother likes you. She's excited you're coming today." I glance over at him in surprise. Will doesn't lie, I know he doesn’t, but this seems hard to believe. He sees the look I've cast his way and shrugs. "It's as much a mystery to me as it is you."